gentlytiptoe: Today, Weirdbunny - my guest blog writer! 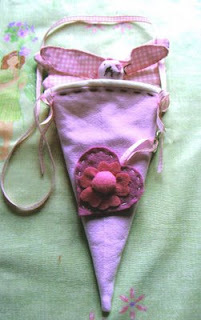 Thankfully Hannah has let me invade her blog just for today to showcase the wonderful bunny I received from Suzie Sews. Yes I've finished my blog, but I just had to let everyone see the bunny Suzie made me as part of an Easter Swap we did. Thank you Suzie ! Hey I know that bunny!!! Hello Hannah I found my way here via Lucylocket and her bunny swap.I am not much of a blogger but I do enjoy visiting other people's blogs.I am delighted to see this post from Julia Weirdbunny. Hi from the states to both of you -I am still hoping Julia will get back to blogging one of these days.